Arthritis causes inflammation of the joints that leads to pain, stiffness and swelling. 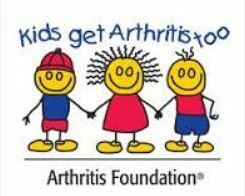 When arthritis occurs in children younger than age 17, it is called juvenile arthritis. Some children may experience symptoms for only a few months, while others have symptoms for the rest of their lives. About 300,000 children in the United States have some form of the disease. Juvenile rheumatoid arthritis (JRA), also called juvenile idiopathic arthritis (JIA). JRA is thought to be an autoimmune disease, the body’s immune system attacks some of its own tissue and cells the same way it would react against a foreign invader such as a virus or bacteria. Certain gene mutations may make a person more susceptible to environmental factors, such as viruses that may trigger the disease. In JRA, the lining of the joint (called synovial membrane) becomes inflamed and enlarged, limiting movement and causing pain and tenderness. Key symptoms include a rash on the cheeks, sensitivity to sunlight, mouth or nose sores, joint pain, seizures or other signs of neurological problems, and chest pain. Inflamed membranes release enzymes those cause further damage to the bone and cartilage. This type of joint and bone damage may cause problems in a growing kid If the growth areas of the bones are affected, the bones may grow at different rates so that one bone may develop abnormally in shape or size. The result could be, for example, that one leg might be permanently shorter than the other. There are several subcategories of juvenile rheumatoid arthritis: Systemic onset type (begins with a whole-body), Pauciarticular onset disease (fewer than five joints are affected), Polyarticular disease (five or more joints are affected, usually involves the small joints), Juvenile axial spondylo arthritis (effects involves the large joints of the lower back and hips), Reactive arthritis (exposure from bacteria, in particular shigella or salmonella), Juvenile psoriatic arthritis (have psoriasis, and have a genetic component), and Juvenile systemic lupus erythematosus (cause inflammation and tissue damage in many areas of the body). First lines of medications for an acute stage of the disease are nonsteroidal anti-inflammatory drugs (NSAIDs) to provide relief the inflamed joints. They work by decreasing the amount of an enzyme found in inflamed joints. The same enzyme, however, helps to protect the stomach, so NSAIDs often cause stomach irritation and ulcers. Low doses of NSAIDs are available over-the-counter, including ibuprofen and naproxen. COX-2 inhibitor is a prescription drug that is thought to be safer for the stomach because it does not have as much of an effect on the enzyme that protects the stomach. Children with severe juvenile arthritis have been treated with drugs that suppress the body’s immune response such as corticosteroids and methotrexate. Corticosteroids can have serious side effects, including weight gain, weakened bones, and interference with growth. Other medications may be effective, including hydroxychloroquine, sulfasalazine, leflunomide, azathioprine and cyclosporine. Thalidomide may be effective for certain children with JRA, but care must be taken to avoid pregnancy. Both polyarticular and systemic JIA are treated with biologics. Biologics target cytokines (control/drive inflammation) such as tumor necrosis factor (TNF), interleukins (IL), and other naturally occurring proteins involved in stimulating the body’s immune response. These are used in the treatment of JIA, generally given intravenously or subcutaneously, includes adalimumab (Humira), etanercept (Enbrel) and tocilizumab (Actemra), Infliximab (Remicade), abatacept (Orencia), anakinra (Kineret), canakinumab (Ilaris) and rituximab (Rituxan). Different biologics tend to work better for different subgroups of the disease. Exposure-response modeling of canakinumab in the avoidance of flares in children with systemic juvenile idiopathic arthritis Y Xiong et al., Pediatr Rheumatol. 2013; 11(Suppl 2), 181.